learn how to correctly cite and reference a wide variety of sources of information. By doing so you will increase your opportunity to achieve better grades. PLATO helps you to learn through experience. It's informative and allows you to test out the ideas presented in interactive exercises. PLATO allows you to learn at your own pace. You may begin with the basic ideas and then progress to more advanced levels. You can work on PLATO for as little as a few minutes at a time, returning whenever you are able. PLATO is a modular and interactive programme so you can choose how you work through. A simple approach is to work through each of the sections. In doing so you will cover the basic principles, work through interactive exercises and view illustrations of plagiarism in real situations. 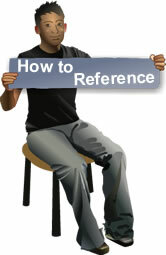 If you are very familiar with the subject, you can move to the Referencing section for specific information on referencing, or to Ready Reference Tutorial to develop your knowledge further. The first part is about the difference between honest practice and plagiarism, and the consequences of deliberate plagiarism, or unintentional plagiarism. The second part is about the correct ways to reference different kinds of sources in your own writing, so that you will never be accused of plagiarism, and your work will have all the elements of good scholarly practice. There will be an opportunity in each part to check your understanding by completing the interactive tests.